are sold I grew up eating super-fresh tofu in Japanese restaurants along the Sacramento river where no one spoke English. Sukiyaki, with its big cubes of soft braised tofu, was the only dish I could name, and hence, order. The experience gave me a taste for this subtle food, which I immediately loved. This was when tofu was made fresh daily, delivered, and consumed within twenty-four hours, unlike today when a box of water-packed tofu can last for many weeks, boxed tofu can be shelf stable for months if not years. 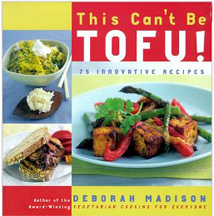 When I was asked if I knew someone who could write a book about tofu, I nominated myself for the job. I wanted to show that tofu was something to enjoy in its own right rather than as a substitute for other ingredients. After all, there’s no need to pretend that tofu is ricotta or meat when it can be delicious infused with ginger, chiles, miso, garlic, or surrounded with curry pastes and coconut milk. It can also be paired with shrimp and fish so it needn’t be viewed as only a vegetarian substitute for protein foods. Although I‘m drawn mostly to Asian flavors with tofu, I also include Western style recipes when they work, such as the meaty Tofu Bachelor Sandwich with steak sauce. My husband inadvertently named this book when I’d bring him recipe samples for lunch. “This can’t be tofu!” he’d say, but it was. And it is. This Can’t Be Tofu was nominated for a James Beard Award.